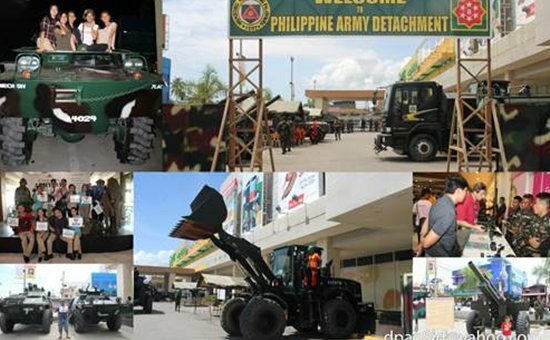 The Army capability assets displayed during the 119th Philippine Army Day celebration at Robinsons Mall, Tacloban City on March 11-12, 2016. CAMP LUKBAN, Catbalogan City – The 119th Philippine Army Day in Visayas hosted by Maj. Gen. Jet B Velarmino AFP, Commander of 8th Infantry (Stormtroopers) Division, Philippine Army was culminated in Robinsons Mall, Tacloban City on March 12, 2016. The commemoration was highlighted with a Civic-Military Parade around Tacloban City as kick-off ceremony, showcasing the Army’s upgraded weapons, disaster response and combat capabilities. Prior to the formal opening of Photo Exhibit and Static Display, was the launching of two Army songs entitled “Sundalo Ako” and “Sundalo ng Republika” which were composed by the 8ID troopers. In line with the celebration, supplementary activities were conducted such as medical and dental consultation, information campaign on Return 119 and Audio-Visual Presentation on the documentaries of soldiers’ heroism and contribution to peace & development, as part of the continuing evolution through reforms and professionalism. Also, a recruitment booth was facilitated for those who want to join the profession of arms. The audience was also serenaded with a musical entertainment by 8ID stage and marching band, dance prowess of 19th and 78th Infantry Battalion and participation of Leyte Idol grand winners. Significant to the event was the conduct of seminar to our soldiers on “Gawin ang Tama” headed by Ms. Heide Sison. Maj. Gen. Velarmino expressed his heartfelt gratitude to the Leadership of the Philippine Army for choosing 8ID as host during the 119th Philippine Army Day celebration in Visayas. “The Philippine Army will endeavor to win the confidence, trust and support of our constituents and it is inherent for us to repay them with our selfless service to achieve a just and lasting peace in Eastern Visayas region”, Velarmino added. LtCol. Roberto Sarmiento, commanding officer 19IB, Col. Francisco Mendoza Jr., commander 802nd Brigade, Mayor Eduardo Ong, PSupt Ramil Amodia, commander of Public Safety Company, and CInsp. Shevert Alvin Machete of Carigara Municipal Police Station during the declaration of Carigara as Stable Internal Peace and Security municipality on March 14, 2016. 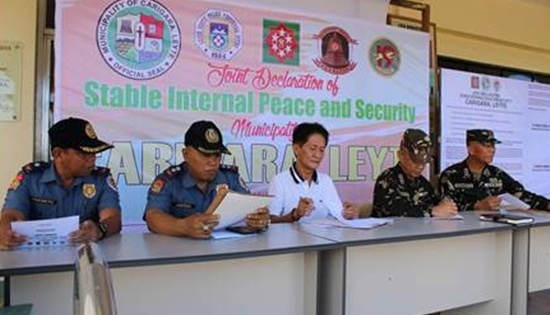 CARIGARA, Leyte – Another Leyte town is now insurgency-free during the ceremonial signing of Memorandum of Agreement (MOA) declaring Carigara, Leyte as Stable Internal Peace and Security municipality here on March 14, 2016. The joint declaration that will surely enhance the peace and security of the municipality was signed by Col. Francisco Mendoza Jr., Commander 802nd Infantry Brigade and Mayor Eduardo Ong. The event was witnessed by Lt. Col. Roberto Sarmiento, Commanding Officer of 19th Infantry Battalion, Superintendent Ramil Amodia, Commander of Provincial Public Safety Company, and Chief Inspector Shevert Alvin Machete of Carigara Municipal Police Station. Lt. Col. Sarmiento emphasized that declaring a municipality or a city as Stable Internal Peace and Security area doesn’t mean the pull-out of soldiers from the area. He also mentioned that there are still six (6) municipalities and two (2) cities under his area of operations that are not yet declared Stable Internal Peace and Security areas. The said towns are Villaba, San Isidro, Isabel, Capoocan, Jaro, and Tanauan. While the two (2) other cities are Tacloban and Ormoc. The said declaration will not just benefit the local government but also their constituents as it will attract more investors in Carigara. LGU is eyeing to boost the employment and the local economy and revealed that at least two (2) business companies are already planning to establish in Carigara. Col. Mendoza said that peace and security in Carigara were attained due to the collaboration of the AFP, PNP, and the stakeholders in the said municipality. “The army remains to be peace advocates, protector and servant of the people.” Mendoza added. 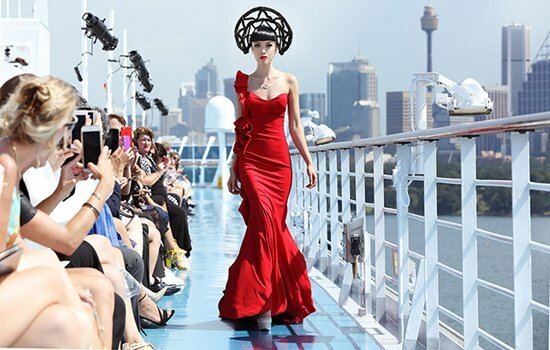 SYDNEY – Global fashion sensation Jessica Minh Anh just added Sydney to her impressive portfolio of sky-high catwalks by transforming the sundeck of Costa Luminosa into an ocean runway. Featuring the Sydney Harbour Bridge and the famous Opera House as its backdrop, J Spring Fashion Show 2016 overtook all the modern fashion productions with a flawless combination of art, architecture, culture, and style. The exclusive red-carpet event premiered nearly 100 haute couture and ready-to-wear dresses from Europe, Asia, New Zealand, and Australia. As Costa Luminosa was anchored offshore, models were catwalking in the middle of the ocean. Opening the show with purity and lightness, Jessica Minh Anh appeared in an angelic multi-layered pink and white dress designed by Australia’s very own brand Bergitta. The exotic beauty was followed by a stunning line-up of models in elegant and youthful pieces using French lace, floral prints, and delicate silk. Adding sophistication and glamour, Pakistani talent Syeda Amera returned to Jessica Minh Anh’s catwalk with an innovative collection featuring three-dimension embellishment, intricate sequins, and handcrafted embroideries. The eye-catching designs in gold and metallic celebrated supreme quality and advanced beading techniques. Aiming to reinvent the concept of modern chic, Romanian fashion house Chotronette introduced a timeless collection with colourful floral details and complex embroideries. The vintage inspired dresses highlight individuality and authenticity. Bringing the dramatic landscape of North Canterbury, New Zealand to the sun-deck catwalk, Beverley Riverina premiered an all-wool collection made from natural, sustainable materials. The creative designer led the ecological and environmental movement while showcasing chemical-free and un-dyed hand-knitted garments. Next, Lebanese haute couturier Jad Ghandour inserted class and elegance onto Jessica Minh Anh’s catwalk with a seductively refined collection. Using colour scheme varying from royal purple to light peach, each piece mixed original motifs with contemporary cuts and structured designs. Closing the show with theatrical imagery, Rouba.G joined Jessica Minh Anh for the second time with her new “butterfly” collection. The light blue, beige, and white pieces at the start, which showed the primitivism of a caterpillar, were quickly replaced by the extravagant dresses in vibrant prints and dynamic colours. The breath-taking finale dress worn by Jessica Minh Anh was an impeccable blend of modern glamour and exquisite craftsmanship. The black and white floor-length design with unconventional cuts perfectly showed off Jessica Minh Anh’s hourglass figure. To compliment Jessica Minh Anh’s extraordinary vision, Lancôme and Redken created futuristic looks with an edgy twist. What stood out the most was Jessica’s architectural hairstyle in the shape of the Sydney Harbour Bridge, which redefined originality and modernization. The show was supported by L’Oreal Australia, Sydney Harbour Foreshore Authority, InterContinental Sydney, The Royal Botanic Garden Sydney, Captain Cook Cruises, RENTaCAM, Bill Hicks Jewellery, Affinity Diamonds, Grain & Co, Big Banner, and SimpleThings Press. With J Spring Fashion Show 2016 came to a triumphant end, one may wonder where Jessica Minh Anh will go next. The renowned model and entrepreneur, who has continuously made the world her runway, has already started planning her next phenomenon in the United States. Having the Grand Canyon Skywalk and One World Trade Center success under her belt, Jessica Minh Anh is set to provide the world with even more surprises in the summer of2016. We shall all wait with excitement. For more details, visit www.jmodelmanagement.co.uk and www.jessicaminhanh.tumblr.com. QUEZON CITY – Partylist coalition Sanlakas called out all candidates vying for national positions to cease finger-pointing and politicking for “all of them are liable in varying degrees” for the much-delayed release of the 93 billion peso coco levy funds to the coconut farmers.”. The group scored all opposing camps for trying to pin the blame on each other for each others’ inaction when “all of them were incumbent senators, cabinet ministers and or simply part of the bureaucracy that failed to deliver justice to the thousands of coconut farmers victimized by forced taxation under the Marcos dictatorship”. “Washing their dirty hands of any accountability is not advancing the interests of the poor farmers but merely saving their own skins from an electoral verdict come May ninth,” said Atty. Aaron Pedrosa, Sanlakas secretary general and nominee. He added that, “Nor will all any amount of damage control by their PR operators conjure what they failed to accomplish in the past three or more years in public office. The electorate will be the judge of their culpability”. The finger-pointing stemmed from a shout out made by senatorial aspirant Kiko Pangilinan to fellow candidates to prioritize the release of the funds once elected that led to a free-for-all among the electoral aspirants. “All this does is add insult to injury – accusing each other or protecting their patrons as the bellies of the poor farmers and their families grumble day in day out for more than four decades now. The injustice to the coconut farmers has gone too far too long wrought by the back-breaking coco levy from 1973 up to 1982, the plunder of the funds by Danding Cojuangco and cohorts to buy majority shares of San Miguel Corporation, notwithstanding the protracted legal battle for nearly thirty years only to be given false hope under this administration,” Pedrosa cited. The group reserved their most bitter criticism for the Aquino government for “doing too little, too late” to abide by the Supreme Court decision on the ownership of the funds and its return to the poor farmers. Pedrosa explained that, “Certifying a bill as urgent is not enough. We all know that Malacañang has all the power and means to serve justice for the farmers, but true to his haciendero character he elected to suffer their impoverished conditions in the midst of a declining coconut industry”. “On many instances in the 15th and 16th Congress, have we seen the Aquino administration move mountains to get what it wants or reject what it doesn’t want from the legislative body. The re-legitimization of “savings” through the GAA Law passed in 2015, despite the declaration of unconstitutionality of DAP easily comes to mind. Or, more recently, when Aquino blocked the passage of the P2,000 increase of SSS pension by a simple veto,” he insisted. The group likewise announced that they are now coordinating with organizations of coconut farmers that will march from the provinces in the coming weeks to push for the return of the coco levy funds. Agrarian reform and financial and technical assistance to farmers are included in the seven point platform of Sanlakas partylist. ORAS, Eastern Samar – The 14th Infantry (Avenger) Battalion, Philippine Army and the peace loving populace of Balangkayan strongly condemn the recent attack by the New People’s Army at the Municipal Police Station in Balangkayan, Eastern Samar last March 7, 2016. Avenger troopers uphold the rights of Balangkayanon during a peace dialogue with local officials and residents wherein they expressed disappointment against the violence and cruelty of the NPA such as the hijack of two Duptours Vans prior to the attack, ransack of the Balangkayan MPS and carting away of nine (9) M16 Rifles, one (1) shotgun, four (4) 9mm pistols and other important documents. Lt. Col. Ronie T Ebarita, commanding officer, 14th Infantry Battalion said that the acts of the NPA clearly show their utter disregard of human lives and concern of the welfare of the local populace despite the efforts of the government to uplift the well being of the people of Balangkayan thru sustained development. “We assure you that your professional soldiers together with the PNP will impose the full force of the law to achieve justice. However, we urge you to denounce these acts of the NPA and support the efforts of the government by providing us information that would lead to the arrest of the perpetrators and bring them to justice, Ebarita added. CALBAYOG CITY – Sen. Francis “Chiz” Escudero on Thursday said he will push for the construction of a bridge connecting Luzon to Visayas to improve trade and commerce between the two islands and hasten the delivery of government aid during calamities. The independent vice-presidential candidate said the infrastructure project connecting Allen, Northern Samar to Matnog, Sorsogon is part of the agenda of the “Gobyernong may Puso” led by Sen. Grace Poe. “Binilang ko na po yun. Fourteen nautical miles kung diretso, aabot ng 18-21 kilometro kung padadaanin sa limang isla para makarating po dito. Mas mahaba pero mas mura. At bahagi ‘yun ng aming mga programa at plataporma,” said the native of Sorsogon province in a press conference here with Poe on Thursday. Escudero said that while the islands are connected through the roll-on, roll-off (RoRo) system, the facility was rendered useless during times of calamities like when Super Typhoon Yolanda devastated Central Philippines on November 8, 2013. “Para wala na ring pong traffic tuwing nagbabagyo. Parang noong nangyari yung ‘Yolanda,’ matagal bago nakarating dito ang tulong at ayuda dahil syempre hindi rin pwedeng maglayag yung mga barge, yung mgaRoRo kapagka bumababagyo. Yan ang hirap saRoRo kapagka may bagyo balewala rin,” he pointed out. Trucks carrying cargoes to Northern Samar are usually stranded at the port of Matnog during peak season of RoRo service, delaying the delivery of goods to the province. “Balak talaga naming gawin yung tulay upang sa gayon makonekta ang Visayas sa Luzon. Pati nga po sa Kabisayaan na karamihan ay mga isla, bahagi sa plano namin ni Sen. Grace ay ikonekta ang Iloilo sa Guimaras, Guimaras saNegros at Negros sa Cebu, para sa ganoon ang komersyo ay tuluy-tuloy,” Escudero said. “Sa Luzon naman ang mahalaga doon ay ang Batangas hanggang Mindoro island. ‘Yun naman po ang aming ikokonekta,” he added, referring to the construction of the “super bridge” project that would connect Mindoro Island to the province of Batangas. Escudero earlier said the “super bridge” will not only ease the travel from the main island of Luzon to the provinces of Oriental Mindoro and Occidental Mindoro but will also bring in more tourists and development opportunities for the people of the two provinces. Last year, the provincial governments of Batangas and Oriental Mindoro received a proposal for the construction of a 15-kilometer long bridge that would surpass the length of the 2.15-km San Juanico Bridge that connects Samar and Leyte provinces. CAMP LUKBAN, Catbalogan City – A member of New People’s Army (NPA) operating in Eastern Samar voluntarily surrendered to 801st Infantry (Bantay at Gabay) Brigade stationed at Brgy Fatima, Hinabangan Samar on March 2, 2016. In a report from Colonel Perfecto M. Rimando, 801st Brigade Commander, the NPA surrenderee was identified as Arturo Pajanustan y Norcio @ Pogoy former member of Front Guerilla Unit (FGU) operating in Eastern Samar. Pajanustan surrendered with one (1) M1 US Garand bearing serial number 1535128 around 4:30 p.m. Wednesday, and is now undergoing debriefing and proper documentation. Meanwhile, another NPA member identified as Rechan Pernis y Dejon @ Alvin/Gil former Team Leader Team Uno Apoy Platoon, Front Committee-Leyte, Eastern Visayas Regional Party Committee (EVRPC) surrendered without firearms to the 19th Infantry (Commando) Battalion stationed at Brgy Aguiting, Kananga Leyte on same date. Moreso, in Eastern Samar twelve (12) former NPA members and thirteen (13) supporters voluntary surrendered to 14th Infantry (Avenger) Battalion without firearms on 26 - 28 February 2016. The unit identified the twelve member as the following: Arturo O Senobio; Lizel Rafales Nable @ Charet/Camela; Alita Pecenio Senobio @ Eva; Julia Orale Rebato @ Ana; Jessie Rebato Nable @ Jr; Danilo Rosco Rebato @ Podin; and Edgar Orga Senobio @ Adana/Bakong. The thirteen NPA supporters identified as: Renato Pecenio Pajares @ Rolly; Necitas Nable Oros @ Cita; Zalda Pazarra Pajarilla; Clemente Ambida Orosco @ Berting; Carlos R Pajarilla; Norma Rosco Rebato; Benjamin Pajares Rebato; Lope P Pajares @ Oping; Alfredo Phak Pajanustan @ Maning; Maribel Pajares Pajanustan @ Liza; Beverly Orantia pajares @ Lucy; and Jerry O Senobio. Lt. Col. Ronie T. Ebarita, Commanding Officer of 14th IB, in his report stated that the surrenderees were coming from Brgy Tugas, Maslog, Eastern Samar who went on lie-low since 2009. They decided to surrender due to the hardship they suffered while in the underground movement. They were also encouraged by the other members who surrendered and availed the livelihood assistance from the government. The surrenderees will avail the Comprehensive Local Social Integration Program (CLIP), immediate cash assistance for their livelihood after the seminar which will be facilitated by the Department of Social Welfare and Development (DSWD). Major General Jet B. Velarmino, Commander 8ID, lauded the efforts of the troops for a job well done. Further, he encouraged the rebels who are still in organization to lay down their arms and return to the comfort of their families and to become productive members of the society. 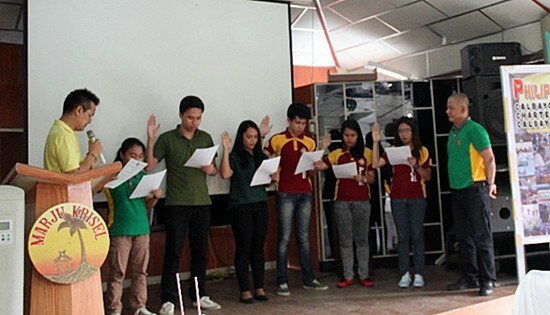 Oath-taking of new PICE members led by Engr. Edgar Mary Sarmiento together with PICE Calbayog President District Engineer Virgilio Eduarte. CALBAYOG CITY – The Philippine Institute of Civil Engineers (PICE-Calbayog) conducts an annual general assembly of all PICE Officers and Members around the City, held at the Function Hall of Marju Krisel Hotel and Resort, Barangay San Policarpo, Calbayog City on February 27, 2016. The assembly bears different agenda; Chapter President’s Report for CY 2015, Presentation and Approval of the Chapter Calendar of Activities for CY 2016, financial report, and the oath taking of the new chapter members for the newly passed Civil Engineers. An opening remark from the Chapter Vice President for the Government Sector, Dr. Romeo B. Santos formally started the general assembly, it is directly followed by the Chapter President District Engineer Virgilio C. Eduarte’s accomplishment report for CY 2015, including the activities of Calbayog Chapter in the previous year. President Eduarte mentioned and acknowledged the awards received by the Chapter during the PICE National Convention held at Bacolod City, Negros Occidental. “Let’s aim to get the first place in most outstanding chapter in celebration of the Civil Engineering Month this year” as he challenges the entire PICE body in the end part of his reportage. The participants of the said assembly whether engineers or not are inspired through the words delivered by the guest speaker Engr. Edgar Mary S. Sarmiento which focus on hard work and quality of work especially in engineering field. Engr. Sarmiento commended the Calbayog Chapter for receiving awards in national level and for being an active and productive chapter in accordance with their proposed activities for CY 2016.